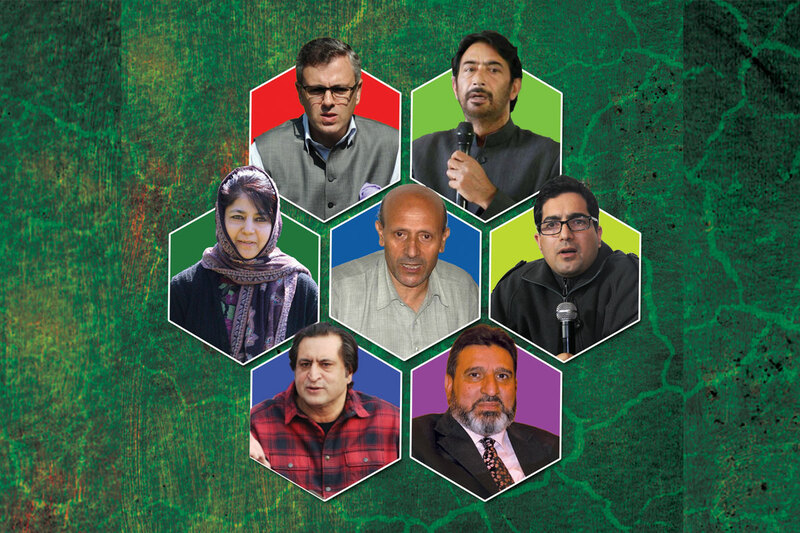 All of a sudden, Kashmir’s political landscape is abundant in political parties as many politicians are readying to be the next Chief Minister of the state. In these interestingly chaotic times, nobody is willing to even consider the Kashmir mandate that is apparently being fractured to the extent that it seemingly has depreciated to insignificance if compared to 2002, 2018 or in 2014 when parties were limited and personal ambitions were well in control. Even the political class is uninterested to understand how to neutralise the indifference that dominates the ground more in the south and most of the central Kashmir in comparison to the north. After a brief experiment in coalition politics in 1987, the project of coalitions stands perfected now. Barring the 1996 elections held in a challenging situation with questionable practice, there has not been a single government in Jammu and Kashmir that was not a coalition. Now when the state is heading towards a new election, most probably in April 2019, to end Delhi’s remote rule, the question is if there would be a two-party coalition or a cluster of parties to make a workable governance system. There are multiple stakeholdings. The political landscape has all of a sudden, widened as the political forces in the unionist camp have started shifting its bases. In certain cases, it is the individual ambition, but in most of the cases, the reason is the political dissatisfaction. Three key elements are fundamentally responsible for the overnight spurt in the proliferation of the political parties – SajjadLone’s serious effort to revive his inheritance, the Peoples Conference (PC) and take it to the next level; the literal disintegration of the People’s Democratic Party (PDP) and the decision of IAS-2008 topper Dr Shah Feasal to leave the luxurious bureaucracy and join politics. The latter, however, is not apparently a major factor, right now, but is emerging to be very important in coming days. Abid Ansari and Imran Ansari. BJP had a plan in hand to achieve the target. After the party pulled out of the ill-fated BJPDP coalition, the party encouraged Sajjad, its ally, to work overtime and manage the support of the disgruntled lawmakers from other parties, mostly the PDP. It spent liberally in managing a bigger pie in the urban local body polls that people invariably boycotted. The idea was to have the magical 44 to rule the state for the remaining two years and then put in more resource and effort to have a significant number in the new assembly. This was Sajjad’s Eureka moment that would have helped him take PC to the next level, become north Kashmir’s first Chief Minister, and sit in the crowded bench of Kashmir’s Chief Ministers: Dr Farooq Abdullah, Omar Abdullah, GhulamNabi Azad, Mehbooba Mufti. But it was a threat to the survival of the political parties and not the mere power struggle that led to the undoing of the plan when governor SatyaPal Malik dissolved the assembly, in a hurry. Sajjad did not get power but got a lot of confidence and even men to showcase that he was up and rising. Even though the PC as BJP’s B-team status has the potential of impacting his growth in coming days, he still is the winner: he has three former PDP lawmakers, and one member of the upper house in his fold and a disgruntled Congressman has recently joined him. Ask anyone about the probable Chief Minister of future Jammu and Kashmir, Lone’s name would find mention with others. For a low-cost operation, this high-value delivery is enough. Seemingly, he is facing a slightly tight position as the political class in Delhi is still struggling to create a consensus with the vital institutions of governance on Kashmir front. However, it was actually the literal disintegration of the PDP that was the key source of the proliferation of the political parties in the state. Almost half of the cabinet that Mehbooba Mufti presided over is out of the party. The “mass exodus” from PDP, according to an insider, was the outcome of leadership issues and multiple power centres that the party created over the years, especially after Mufti Sayeed’s demise. 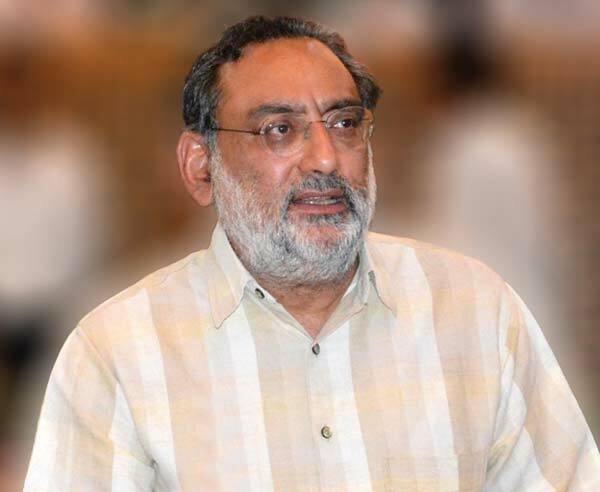 Haseeb Drabu, the author of self-rule, the key negotiator and co-author of Agenda of Alliance, was humiliatingly sacked. He stayed away from the party until the house was dissolved and silently sent his resignation to Ms Mufti. By now, a fence sitter, he is back to his routine. 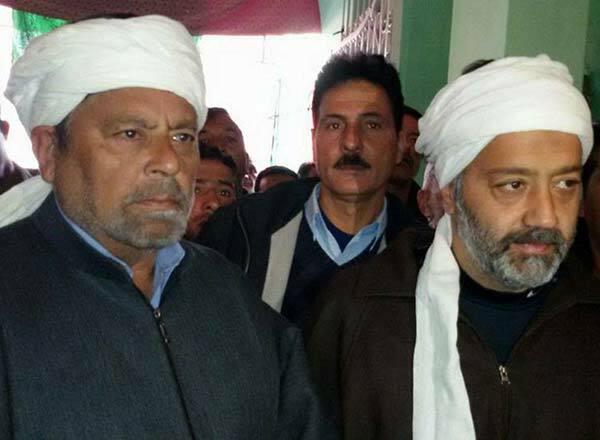 Unlike Drabu, the flock that left the PDP after the fall of the government has joined various parties: the Ansari uncle-nephew are with PC along with Abbas Wani; Basharat Bukhari has joined NC along with the PDP founding worker and former MLA Peer Mohammad Hussain; Javed Mustafa Mir is out but is keeping his cards to his chest. Interestingly Peer was a die-hard anti-NC man. When he was appointed as Chairman of the Muslim Wakf Board that has its head office in the Nawa-ie-Subh complex, he ordered a new staircase to reach his office. When asked about the decision, he said he is not ready to use the same staircase that the NC leaders are using. “When this kind of a man is forced to leave the party, one must understand what is the state of the party?” one insider suggested. But the most important development is the expulsion of Altaf Bukhari, Kashmir’s major businessman who has been in virtual politics for a long time before he actually joined the real one. 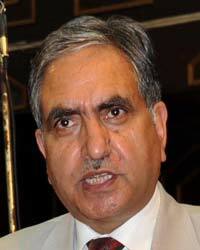 A party treasurer and former finance minister, Bukhari has remained controversial since Mufti Sayeed passed away in January 2016. PDP has publicly stated that Bukhari pushed the party into a sort of blackmail when he showed his willingness to form the government at a time when Mehbooba was bargaining with Modi government over the implementation of the Agenda of Alliance. After Mehbooba took over, he was dropped, only to be recalled back to the cabinet, after some time. He was the natural successor when Drabu was shown the door. Bukhari was back to the news when, after the fall of the government, he managed a consensus within the parties to create a grand alliance. Insiders in the political class suggest that he initiated the discussion with Dr Farooq Abdullah who convinced Omar to approve it. Then Congress got involved at the central level. Initially, his idea was that Dr Farooq should lead this ‘limited purpose government’ to defend the Article 35A but NC refused to lead it. But Omar was unwilling to get his father into the maha-gathbandan. He also conveyed to the political go-betweens that no grand alliance would be supported under Muzaffar Hussain Baig. Later, he was nominated by the state Congress President Ghulam Ahmad Mir. PDP also was not supportive of this idea and Bukhari had suggested the party leader must ask her lawmakers about a choice. (Some PDP insiders said Basharat Bukhari has claimed that he was the consensus choice of NC and Congress but his own party was not supportive of it.) The process reached a level where the three parties were in a position to approach the governor. Raj Bhawan’s fax machine could not receive the request on a holiday. As Sajad Lone also staked the claim, the house was finally dissolved. Bukhari took an offshore flight to cool his heels. But the dissolution of the House did not close the windows of disagreement and ambition. Apparently perturbed over the “mass exodus” of the party men, Bukhari opened up. He is reported to have conveyed the party leadership that members have lost confidence in her leadership and she must step down. He had a series of meetings with various members as a result of which, the party sacked him. 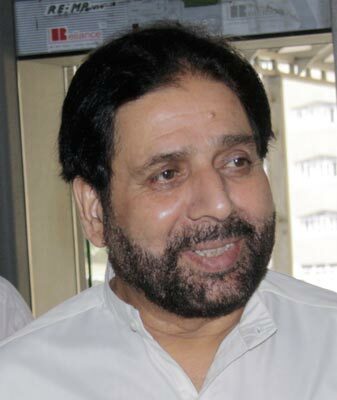 Though Bukhari is publicly saying that he would be contesting independently to retain his Amira Kadal seat, the impression in the market is that he is pulling out a few more from his erstwhile party and getting the support of his friends Ghulam Hassan Mir and Hakim Yasin to run a new party, maybe the Third Front. When that happens and, if at all, it is happening, is something that time will decide. Unlike all others, he is a fit candidate who can own a party. Unlike past, indications suggest, he is being looked at more favourable these days in Delhi, though not at PDP’s cost. Delhi is not interested in harming PDP further, sources suggest. “This is plain opportunism,” one PDP leader said. “The fact is that the party is almost in 2008 status. The people who were for the party are in the party even now, and the people who were in the party for the power have left it to explore other options.” Off late, the party is attempting to reinvent itself by getting back to the militant families, seeking apologies for the toffee comments and taking its traditional hawkish stand to the next level. One PDP insider said that they are reclaiming a territory, read south Kashmir, which lacks any competition to the party other than the militants. “Avoid writing our obituary, we are and we will be,” one senior leader said. However, the crisis on the ground for both NC and PDP is their baggage. Whenever they come out with a statement, 2010 and 2016 comes to haunt them. For Sajjad led PC, they want people to vote for the development, a new plank to woo voters. The quick decision-making by Dr Shah Feasal has added yet another dimension to the proliferation of the political parties in Kashmir. Initially, he was expected to join the NC even though, on various points, he has a common cause with the separatists, whom he is unwilling to join because of the costs it entails. However, he took a U-turn and decided to seek the opinion of the people. This has changed the model of his politics, instantly. The IAS 2008 topper’s initiation of crowdfunding has strengthened the feeling that he will eventually be having his own political party, sort of a one-man party that will initially contest the LokSabha from north Kashmir. The earlier political grapevine was that Kashmir parties – NC and PDP with the help of Congress, will field three persons in independent capacity from the south, north and central Kashmir constituencies who will go to the LokSabha and make the tough-talking on issues confronting Kashmir. Those propounding this idea were saying that sending three ‘free-floating electrons’ to the LokSabha will help parties insulate their party lines while permitting the trio to talk about the ground situation and the challenges Kashmir is facing. This, they said would have been a sort of facilitating dialogue with the people of India directly. With Shah Faesal moving towards his own party seemingly has burst that “idealist bubble”. Now people are even saying that in a situation if the LokSabha and assembly elections are held separately, Mehbooba Mufti can spring a surprise by contesting the south Kashmir seat personally. The rise of Shah Feasal element in north Kashmir will eventually compete with the Engineer Rasheed phenomenon in the region. Though a one-man army, AwamiItehad Party (AIP) is gradually appealing the south region better. In the volatile region that has remained indifferent to the unionist political class in the last few years, Rasheed is gradually emerging a small force that has the potential to disrupt political calculations of various biggies. A Kashmir University Professor on condition of anonymity says that Faesal’s entry could help Delhi to improve the voter percentage, which in recent past was surprisingly low. This scenario speaks volumes about the transition of Kashmir from a single party system to a multi-party stakeholding. The proliferation of political forces in Kashmir is taking place at a time when the other regions are focusing on consolidation. Jammu is unlikely to have a third party and the voters will choose between two national parties – the BJP and the Congress. However, deeper in Jammu in Muslim majority Pir Panchal and Chenab valleys, the chances of the division of the mandate is possible on the 2014 lines. This division will be display again in 2019 if the PDP, Congress and NC will not have a tactical understanding even at the candidate fielding time. 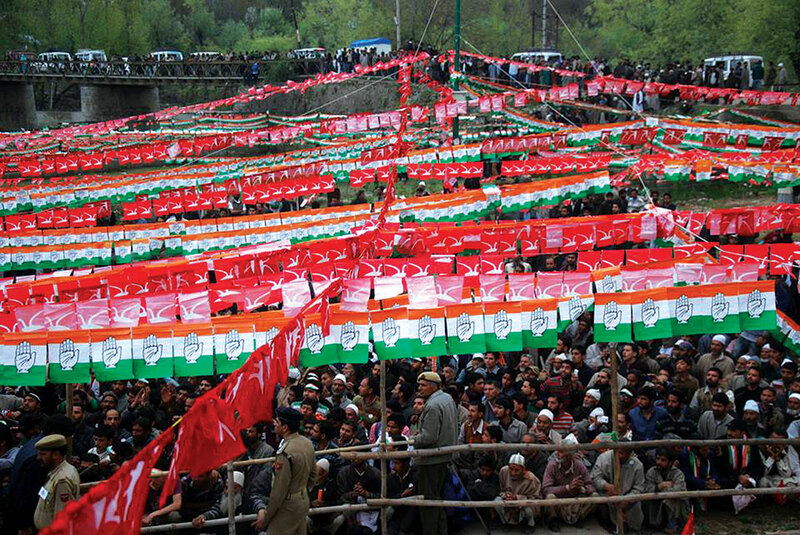 A photo of a political rally in Ganderbal. Interestingly, the political class is not interested in understanding the ground situation, especially in the south and central Kashmir where the voter is indifferent. In such an indifference, when lot many people who would seek votes, the outcome will be based less on participation and more on manipulation. That will take Kashmir to the next level of chaos. The only response that the political class has is that the people will have to give a mandate to one party. But when a few hundred people cannot understand the costs of division in a multi-party stakeholding, how can six million people reach a sort of consensus?